Covesting always strives to be at the forefront of technological innovation. We are developing our amazing cryptocurrency trading platform very actively and with great attention to detail. Our team is working day and night to make it better and better, and we are very thankful to each community member for bug reports, your feedback is extremely valuable for us! We worked very hard to release the desktop version Beta 1.0 without any single day of delay, and it was widely accepted by users. Now, the beta version of the platform is available for everyone! Read more information about the release and all current available features. 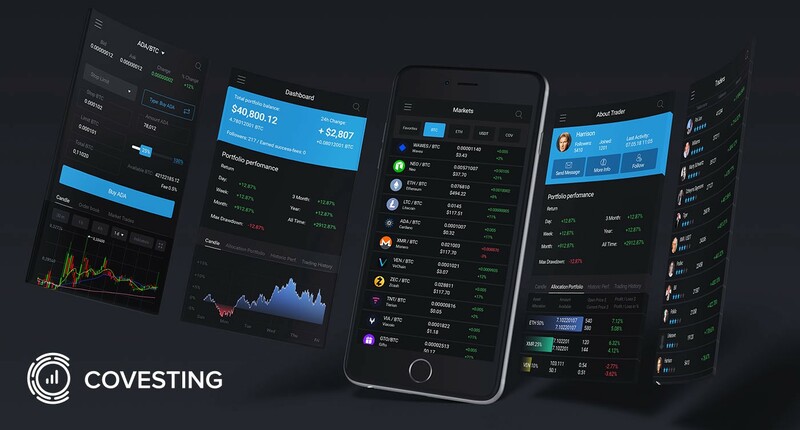 Trading on crypto markets is like riding a roller coaster, you should always be on guard not to miss a big win, and you definitely won’t with Covesting! Our new piece of art is coming very soon — our mobile application. We initially developed it for iOS, but it will be available to users of Android too. The goal is to make mobile application as efficient and functional as the desktop version. Are you a passionate traveller? Or a businessman who spends 25 hours a day at business meetings and on business trips? You will have crypto markets in your pocket with all standard functions available to you: make the right crypto decisions whenever and wherever you are!